Tiny flowers appear amongst brightly coloured bracts. 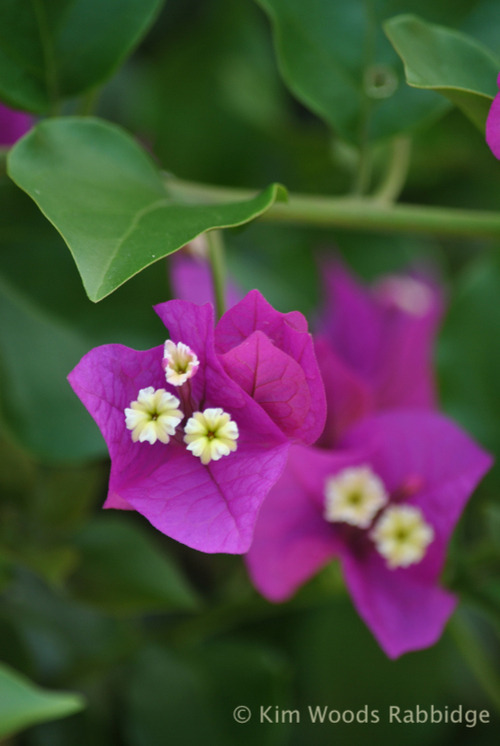 Strong, hot colours have always been associated with the older, larger forms of bougainvillea but smaller Bambinos have a wide range of colours, including pastels. 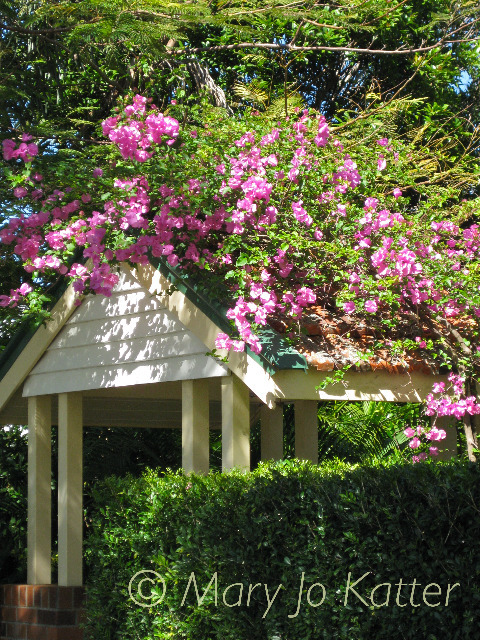 Bougainvillea adorning a lych gate. The smaller varieties are adaptable to a wide range of uses, and more importantly suit the scale of smaller gardens. 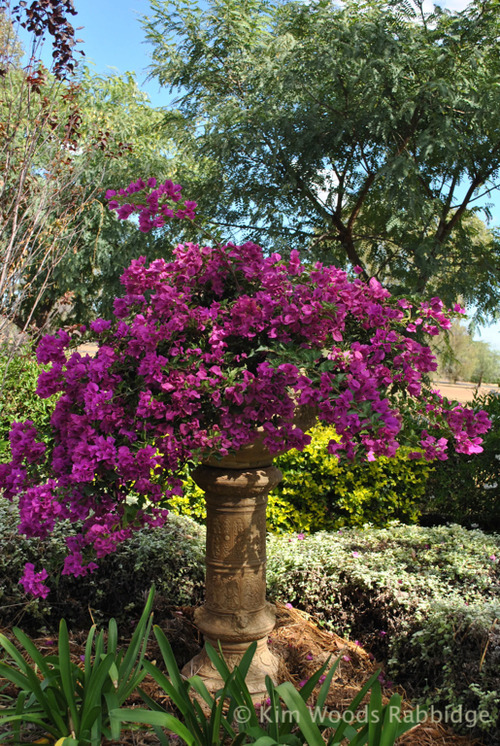 A boldly coloured boug makes a great focal point spilling over a a plinth in the the Coulton’s garden, Goondiwindi. 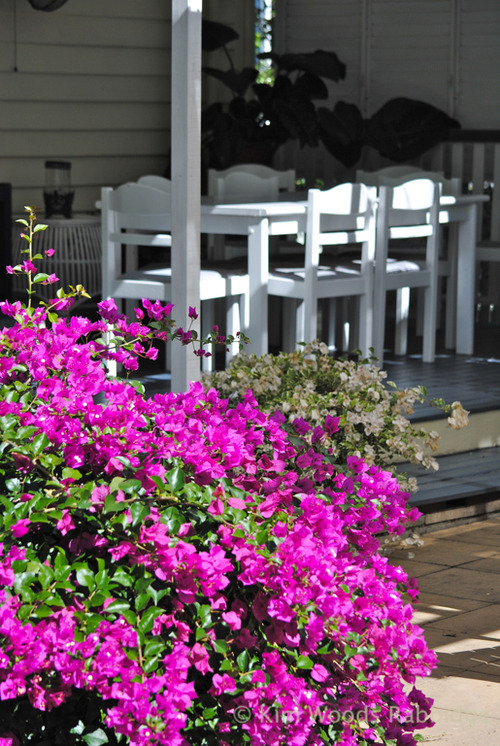 If you can’t devote much time in your garden then boungainvilleas in pots or baskets can be spectacular – i.e. minimum effort and maximum effect! 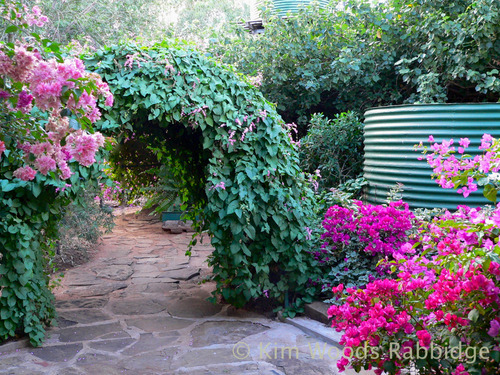 Shaping, or pruning the plant from when it’s young will pay dividends. 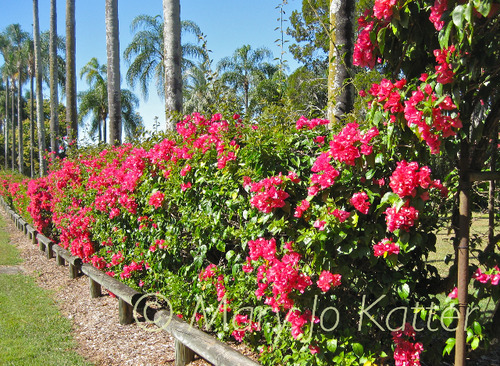 Give large plants a strong, easy care support frame as you won’t want to tackle the thorns to maintain the structure. For Bambinos, trim water shoots to keep plants compact. 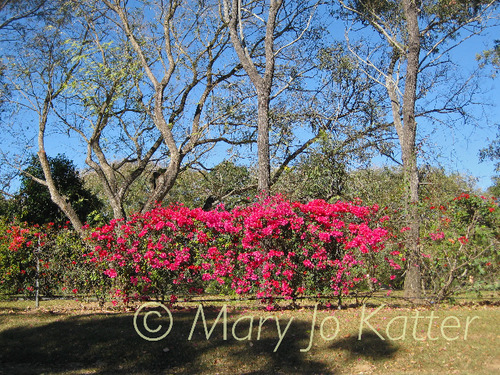 In winter when some trees are in their quiet, leafless mode bougainvilleas add a bright note. Remember that different colours flower at slightly different times, so keep the rhythmn and pattern of colours in mind for planting on a fence, or as a hedge. Planted en masse – they make a striking impact. 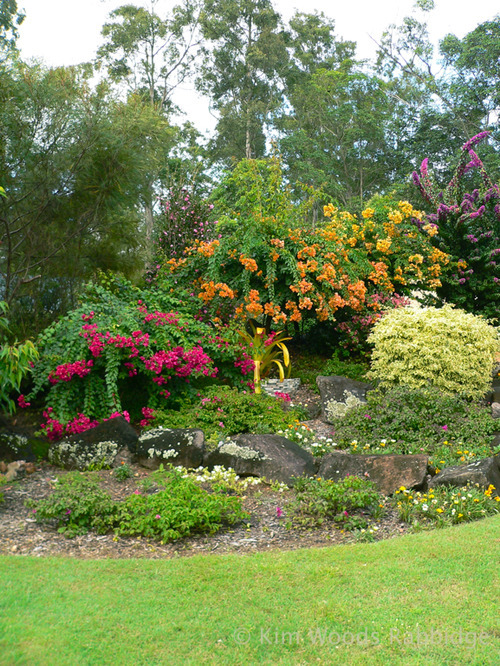 If you have a ‘wild garden’ then this may be OK… otherwise, it’s definitely a good idea to trim early and trim often! 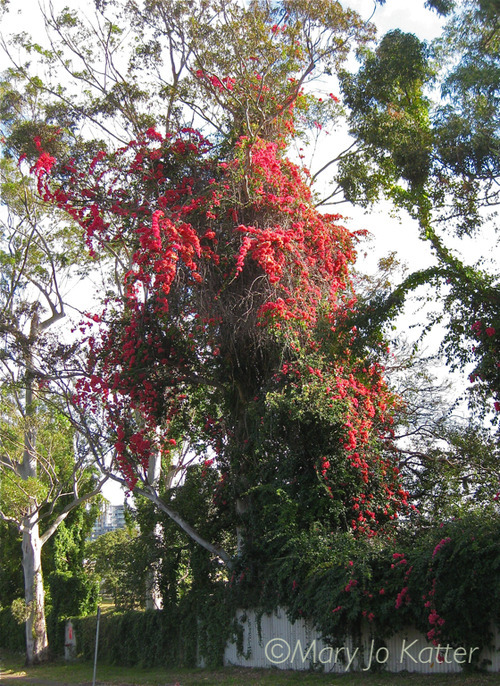 At Tall Trees, Mt Nathan: bougs with different traits – some weeping and others head skyward. 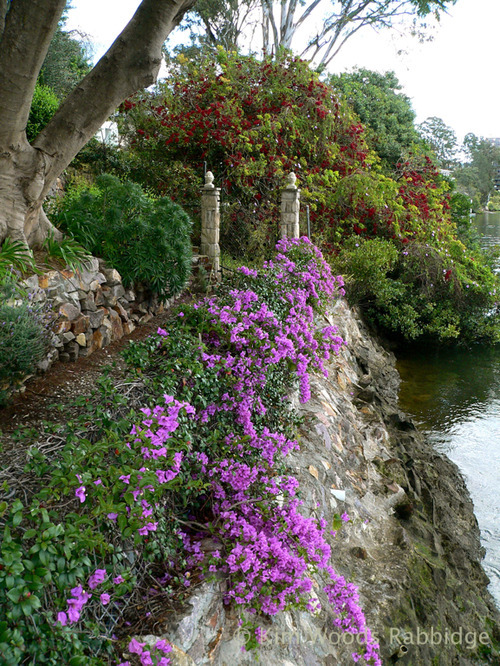 Bougs are good for dry climates – they don’t need too much water, and like good drainage. 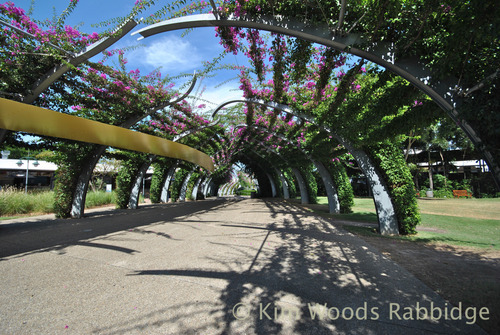 Sometimes it’s difficult to find bambinos – Vanderlay Nursery in northern NSW have a good range and supply.